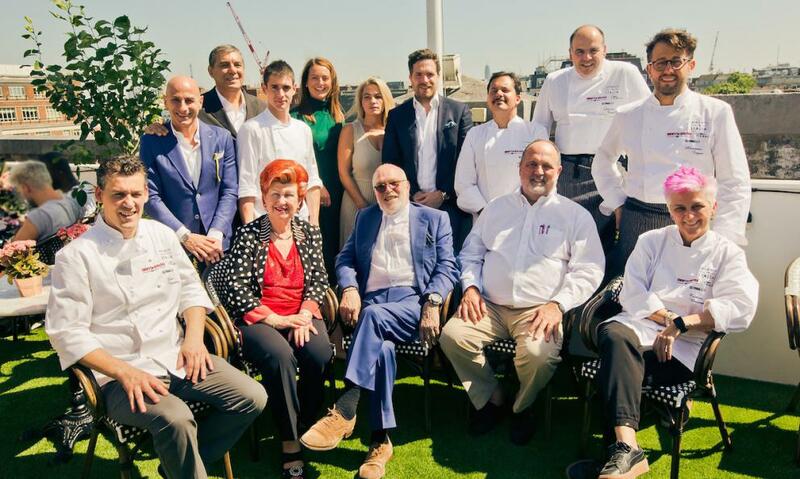 London, we at Identità were back in the British capital with an extraordinary group of chefs arriving from Italy, ready to settle in the kitchen of a recently renewed restaurant on the top floor of Selfridges in Oxford Street. 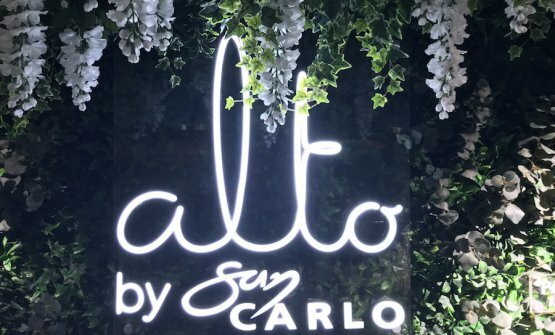 Given the view over the rooftops of London, the owners, theSan Carlogroup, decided to call it Alto. The group has 1200 employees and dozens of restaurants scattered around England. Distefano, from Ragusa, in Sicily, founded the group. He arrived 17 years ago in the north of England and then grew professionally while focusing on Italian cuisine. Viaggio in Italiawas the title given to the event and Distefano participated with his sons Sasha e Marcello, and with the chef from Alto, Luca Terraneo. It was an incredibly sunny and hot day, an unusually hot summer for London, with a heatwave on Monday, Tuesday and onwards and people panting in the streets. It was different up there, thanks to the air conditioning and the play of breeze, what with the mobile windows and the terrace and a decor that recalled the colourful stripes of a beach hut. Blazing sun at lunchtime, a moving sunset in the evening and everyone admiring how each dish was deliciously finished and assembled. There was only one glitch: Corrado Assenza, the logic arrival point for a Viaggio in Italia, the patron of Caffè Sicilia in Noto, was affected by air traffic over Europe and only arrived late in the afternoon. So from an airport in Milan he instructed Iacopo Zambarbieri to make the first dessert, and the latter prepared a perfect Fruit salad with pan di spagna and custard with Marsala. Then in the evening, Assenza made the planned Guardaaa… La Sicilia!!! A perfect mix of Cream with double fiordilatte and pistachios from Bronte, custard with gin and wild thyme, cuturro made with durum wheat and almonds of the Romana di Noto cultivar, pink grapefruit marmalade, pastry with sheep’s milk ricotta. Everyone wondered what was cuturro: it’s a sort of ancient polenta made with durum wheat, of Arab origin. While Assenza, being a sublime pastry-chef, ended the menu, Alessandro Negrini, the creative engine of Il Luogo di Aimo e Nadia together with Fabio Pisani, took care of the opening. 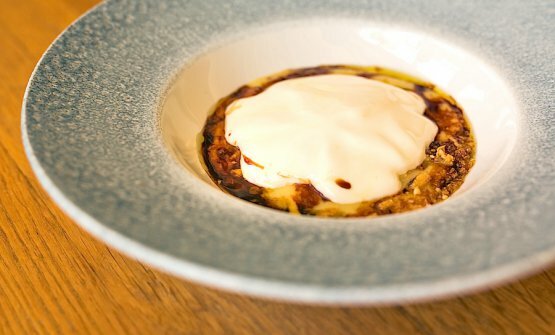 The chef from Valtellina brought cicerchie and prepared an intriguing entrée: Cicerchie from the Monti Dauni in a cream with taleggio from Valsassina and mosto cotto made with figs, a mix of Lombardy and Apulia. There were two first courses. After all, as Italians, if we don’t give enough space to carbohydrates, we feel we lack something. 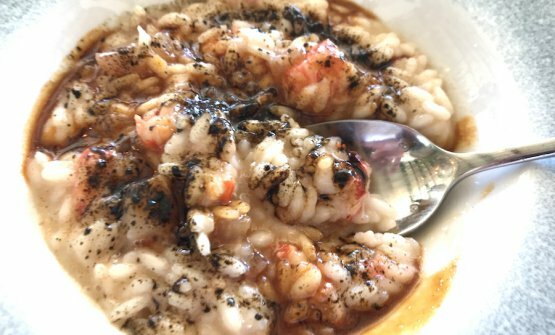 So Annie Feolde and Alessandro Della Tommasina, representing Enoteca Pinchiorri in Florence, presented an incredible Risotto with prawns, veal nerves and powdered liquorice. I had a second helping because when something is extraordinary, pleasure wins. I don’t love liquorice because few know how to tame it. They do, and I sincerely appreciated it. Then Cristina Bowerman of Glass Hostaria in Rome made Rigatoni Monograno Felicetti filled with artichokes alla romana, vignarola, bottarga and anchovy roe. Each piece of pasta was filled with cream in a perfect play of filling and seasoning. And between pasta and dessert, came the sea. Amberjack wrapped in lemon leaves and smoked provola, toasted raisins, by Alfonso Caputo of Taverna del Capitano in Nerano on the Amalfi Coast. So fresh and sapid that it proved the rule according to which fish and cheese don’t go together wrong. Those who can’t cook, should better stick to the rule. But good chefs can make their exception.. The food was truly lovely. A brilliant and tasty Italy. And the drinks were just as good, with two options for every course, wines from Zonin1821 and beers from Birra del Borgo. Plus there was a moment of distraction at sunset, when Filippo Binucci baked some white focaccia and served it to the chefs with oil and mortadella. Pizza and mortazza, to everyone’s delight.